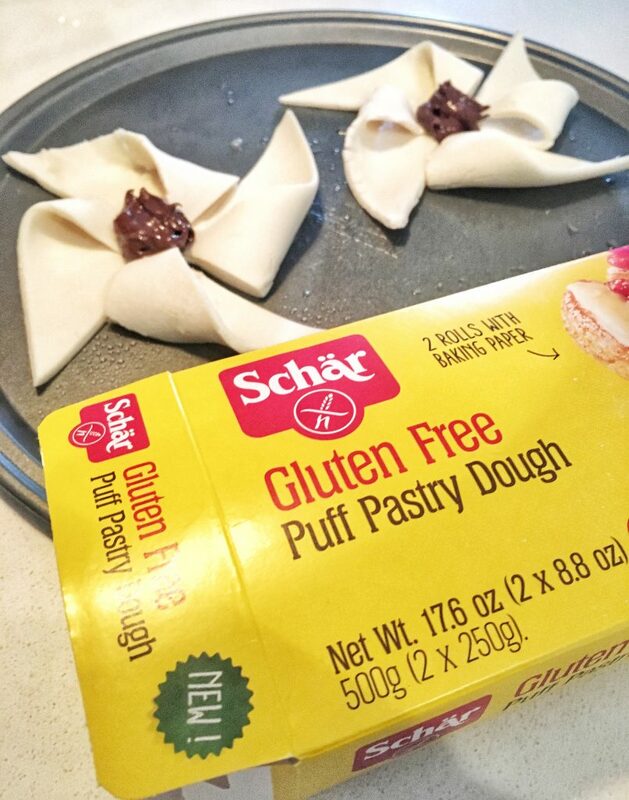 Learn how to use Schar’s NEW Gluten Free Puff Pastry Dough! 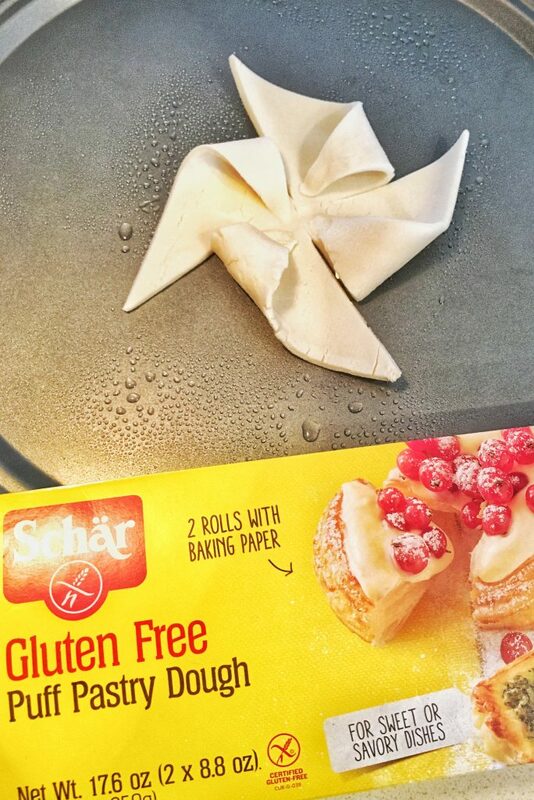 Schar Gluten-Free Puff Pastry Dough is exactly what you’ve been looking for. Gluten-free puff pastry dough has been incredibly difficult to find, and it’s always contained dairy – something I can’t have. But Schar puff pastry dough is dairy-free and egg-free, and only contains soy as an allergen! As always, check to make sure that this Schar product matches your unique nutritional needs. I first showed off Schar’s Puff Pastry Dough at Natural Products Expo West 2018! I was so excited to finally get my hands on some, thanks to our Anniversary sponsor Schar! Unfortunately, we still don’t have it here it Arizona, but plenty of readers have spotted it in their frozen foods section across the USA! However, being a celiac forEVER (okay, 10 years) I didn’t even know what to make with puff pastry dough. I hadn’t used gluten-free puff pastry dough since being diagnosed. What was I going to make with it? Of course I went to Pinterest and YouTube to explore. I found this Tasty video and decided to experiment with a few on Schar’s new puff pastry dough. It’s pretty easy to make these elaborate looking pastries – honestly! Now, gluten-free puff pastry dough is a little more difficult to work with (of course everything is because it doesn’t have gluten’s elasticity), but with a little bowl of water and some patience, you can really nail gluten-free puff pastry recipes! Just make sure you defrost the puff pastry dough for at least 3 hours. Unroll it slowly and carefully and mend any cracks with a little bit of water and your finger. Then, cut the dough using a pizza cutter or knife into squares or the shapes you need for each pastry. Carefully fold the dough, working out any tears with a little water and your finger. Add on the toppings and fillings before you put into the pre-heated oven. Make sure to follow the instructions for baking on the box! Pinwheels like these take a shorter amount of time than more intricate designs – so don’t burn them! 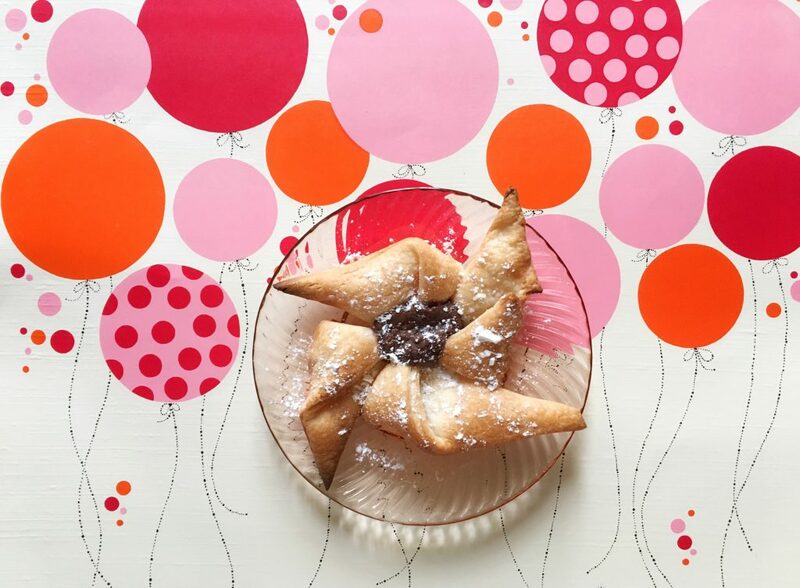 The pinwheel worked best with the puff pastry dough – and really allowed the puffiness in the wheels to shine! It also baked up the best and avoided any soggy bottom that you could get with the more elaborate use of the dough. I used Rigoni di Asiago Nocciolata Dairy Free Organic Hazelnut Spread and organic jam for the fillings. 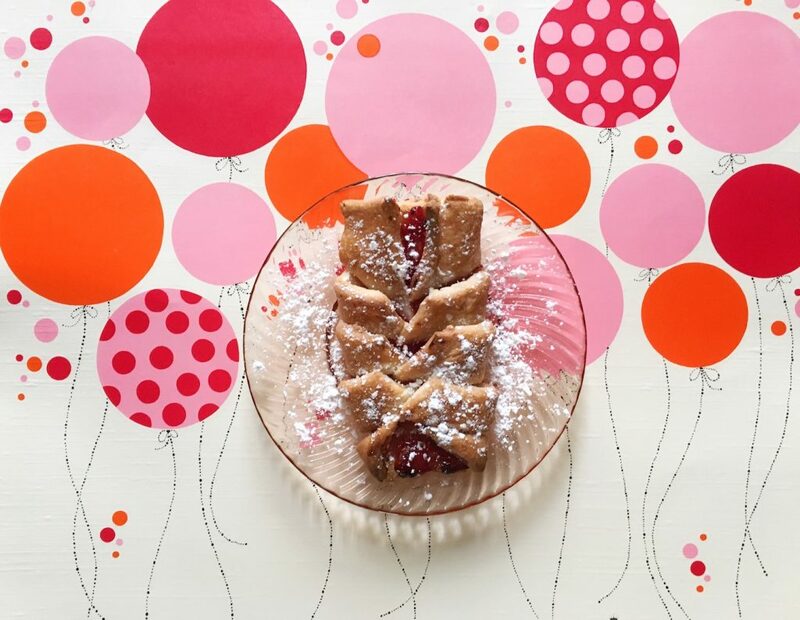 Of course, everything puff pastry is way better with organic powdered sugar on top! This gluten free puff pastry dough is a hit in our house, but we’ve got to ration it until Schar puff pastry dough reaches Phoenix! Have you seen it in your neck of the woods? I’m so thankful to Schar for their sponsorship of Celiac and the Beast! Don’t forget to enter our huge anniversary giveaway! Just found this at a local grocery store with a few locations called Oliver’s Market in Northern CA for $8.49. Thank you for the inspiration. I cannot wait to use it! Schar also has an amazing product locator that I really appreciate so folks can use that to find some of this puff pastry gold wherever they are! I found the Schar puff pastry at my local Safeway! I can’t wait to make pinwheels with it. 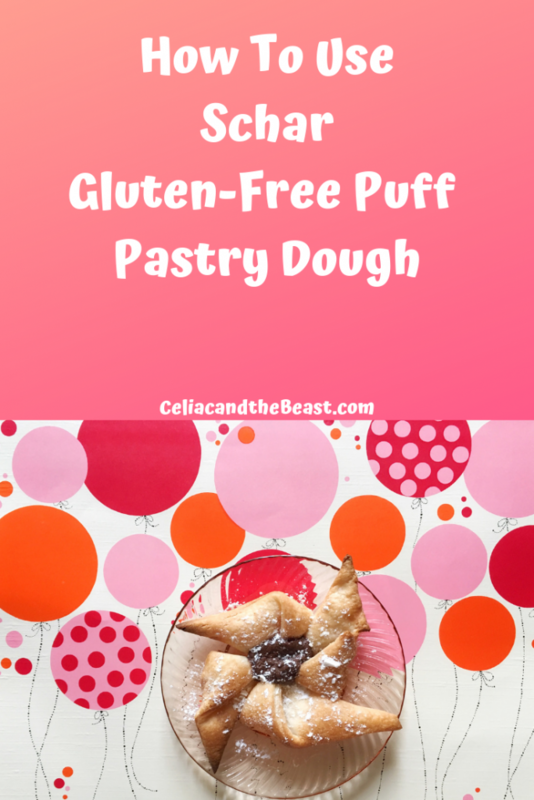 Thanks so much for the heads up about this gluten free pastry dough!! So excited to use it! What a great find! Thanks for sharing, and I love all your ideas you gave those pinwheels look awesome! Such a great idea , the pinwheels are to die for! I had these a few months ago and they were delicious! I can’t find them at the store anymore. I hope that they come back soon, they were amazing! It hasn’t been quite 7 years since I was diagnosed. (It will be 7 years for me in July.) So much has changed though! Even in this short time so many new products have come out. I’m really looking forward to trying the Schar puff pastry dough. Hopefully I can find it near me soon!